Date unknown but after 1953. Another May Procession in honour of our Lady. The photograph appears to have again been taken in Priory Road - almost from the same spot as the one from 1957 or 1958 below. 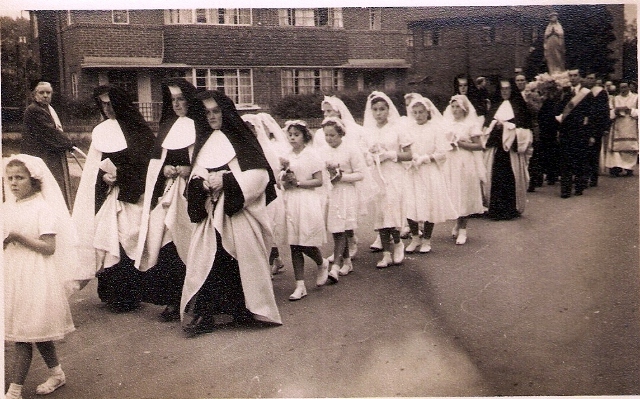 Although undated it cannot be earlier than May 1954 for it was in the autumn of the previous year that the Presentation Sisters who are shown accompanyong the children in the recitation of the rosary, arrived from Ireland to begin teaching in St. Mary's School. In those days when Roman Catholcs kept themselves to themselves and before the openness that followed the Second Vatican Council one wonders what thoughts are going through the mind of the onlooker observing the procession going past. Many thanks to Monica Smith for the loan of the photograph.